Car Hire Checklist - The Essential Guide to Renting a Car? 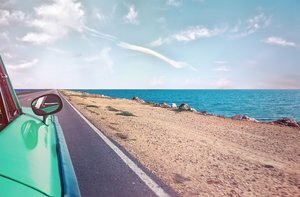 Car Hire Checklist - What do I need to know about my car hire? Much of making sure your car hire goes smoothly is about the planning. Know what to expect before you go and you should have a hassle-free enjoyable experience. Driving Rules - If you are driving in a foreign country, you will face unfamiliar road signs, different types of junctions and drivers making unexpected manoeuvres. Find out what the rules are for the country you are driving in. Make a list of any compulsory equipment because you will need to check this is in the hire car when you arrive. Your Car Hire - Have a read through the terms and conditions of your car hire contract. Will you have to pay any additional fees at the desk such as for young drivers or for going across a border? Are there any restrictions on where you can drive? Are you on a limited mileage contract? These can be expensive if you are likely to do a lot of driving. Better to find out any issues before you get there. Car Hire Insurance - It is important to establish what insurance comes with your hire car. Find out what extra insurance they may offer you at the desk. Compare this with policies available through the MoneyMaxim Car Hire Excess Insurance Comparison Service. These are personal policies that cover you and not the car. If you are concerned about how they work, then please call us on 0800 520 0699 and we will happily discuss it with you. Driving Licence - It is not only about having a valid licence. Some countries will insist you also have an international licence too. Since the paper part of the UK driving licence was abolished in 2015, you may need to get a code to allow car hire companies access to your driving history. Not all car hire desks will ask for it but it costs nothing to do so why take the risk? Credit Card - You will almost always be required to have a credit card when you pick up a car. Make sure yours is not only valid but has enough credit limit on it for the hire company's requirements. The excess amount they require should be listed on your car hire agreement within the insurance details. The Car Hire Voucher - Print off two copies so that you can keep one and hand one in at the desk when you arrive. Check the dates, times and locations are correct. Have you given the car hire company your flight details? It is a good idea to do so as, if your flight is delayed or cancelled, they will be aware. Take their contact details with you too so that, if you know you will be late, you can let them know. If you don't, they may presume you are not coming and hire your car out. Insurance - If you purchase independent car hire excess insurance, print out the documents and take them with you. You will not necessarily be asked for them at the desk but, if you have an incident, you may need to contact your insurer. Check for Damage - Inspect the car with a member of staff from the car hire team and point out every bit of damage which should then all be recorded by them on a sheet. Don't forget the wheels as alloy wheels in particular can get dents and scratches from everyday use and damage to your wheels is often not covered by the insurance that comes with your hire car. Take photos on your phone. You are quite within your rights to do this. You can even use a selfie stick to take photos under the car! Ask for a copy of the sheet where the representative has noted down the damage. Fuel - Check the fuel level is where you are expecting. If you opted for a full to full policy, then it should be full! If necessary, point out any discrepancy to a representative. Taking a photo of the fuel gauge is a great way of knowing exactly how much fuel you need to put in when you return. If you are unsure what fuel the car uses, check this with the car hire desk. As you drive away from the pick up location, keep your eyes peeled for local petrol stations as this can save you a hassle if you are in a rush for your flight back. Equipment - Remember that list you made? Now is the time to make sure it is all in the car. If it isn't, ask for it. Before you drive away, make sure all the lights, the windscreen wipers and the air conditioning, if you requested it, are working. You don't want to spend 2 weeks in a boiling hot car. If you would like assistance to understand the controls of the car, ask for help from a member of staff. At the Desk - Confirm with the desk when you are expected back and ask for instructions regarding the car's return. Make sure they are aware if you plan to go across a border. If you need a transponder for toll roads (common in Portugal), you will need this activated. You may well be offered additional insurance at the desk and this is where your previous research will help. If you have bought independent excess insurance, do not feel pressured into buying another policy at the desk. Car hire companies can use various tactics to persuade you, so understanding the insurance you have is important. If you experience any problems during the hire of the car, contact the hire company. If you have an accident that involves a third party you should contact the police. Some countries may have more rules when it comes to accidents. When you return the car, you will need to fill out a damage report which should be signed. You will also have to pay up to the excess limit listed on your car hire agreement or possibly more if it is an area excluded from the CDW such as the roof of the car. Timing - This may seem obvious but don't be late! If you return the car later than stated on your contract, you may face a charge. Don't forget you may have to stop for fuel on the way. Car Checks - Before you set out on your return journey, clear any litter from the interior of the car. If there is a large amount of mud or sand, a quick brush or hoover can save you being charged cleaning fees. When you drop the car back, look the car over for any new damage with a car hire agent and use the photos you took when you picked up the car if there are any disagreements. If you are returning the vehicle out of hours, take more photos. It doesn't matter how dark it is! Using your phone will ensure the photos are timestamped. Documents - You should be issued with a copy of a document to say you have returned the vehicle. If you are not provided with confirmation there has been no new damage, then ask for a signed report stating this before you leave. If there is new damage, then you should be issued with a new damage sheet by the car hire company. Disputes - Sometimes, despite all your best efforts, something goes wrong. If you need assistance with your issue then the following organisations may be able to help.